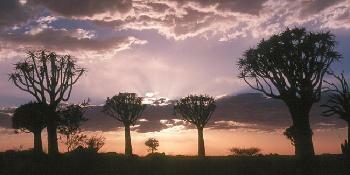 Namibia is a country of striking natural beauty. Famed for its deserts, this slice of south west Africa also has a wild side, including a dramatic flank of Atlantic Ocean, spectacular spiky massifs and Africa's largest salt pan. Among the auburn sand is a good place to start. 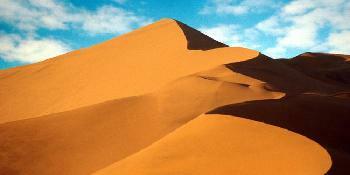 The Namib Desert, with its mountains of ever-shifting amber, acts as an impressive entrance before you reach the imposing Sossusvlei sand dunes in the south of the park. 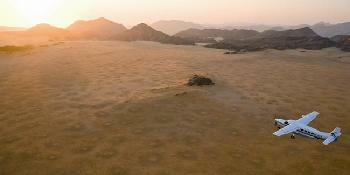 Up to 300 metres in height, these red clay dunes really come to life when the setting sun begins to change their colour. There is more to uncover beneath the sand too including the ghost town of Kolmanskop, which was once a diamond-rich mining settlement, but has now been given over to the sands of time. Visitors can tour the abandoned houses, deserted skittle-alleys and desolate ballrooms. Many of Africa's large mammals, elephants, giraffes and black rhinos, reside in the dry river beds of the Namib Desert, but those wishing to see the 'Big Five' should head to Namibia's greatest eco-region, the Etosha National Park. Known as the 'Great White Place', Etosha was once a large inland lake that has long since evaporated and is now an immense, silver pan of salt-encrusted sand. Large enough to see from space, those wishing to get a little closer should take a self-drive safari and witness the 'Big Five' close up at the park's southern waterholes. It's as striking as a safari gets. 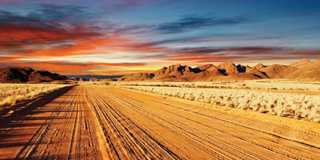 A mountainous wilderness region famed for its outstanding natural beauty including 'The Brandberg' - Namibia's highest mountain and home to the famous 'White Lady' Bushman Painting. A 22,270 square kilometre, malaria-free game reserve situated in the north, dominated by a huge mineral pan providing a white, shimmering landscape. 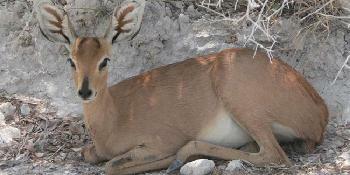 Etosha is a sanctuary for black and white rhinos and large heards of elephants. The world's second largest canyon, arguably Namibia's most spectacular geographical phenomenon, is absolutely magnificent and breathtaking in its immensity. 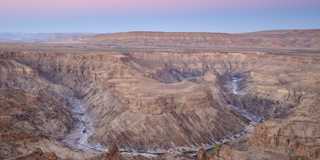 The canyon is in the south of the country at the end of Namibia's longest river - the Fish. 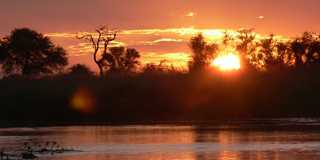 The north eastern region, which includes the Caprivi Strip, and where water flows year-round, forms a stark contrast to the aridity of much of the rest of the country. It is a mosaic of woodlands, riverine forests, swamps and woodlands. The small town of Otavi, along with Grootfontein and Tsumeb, is part of the so-called Triangle, a relatively high-rainfall area which is agriculturally prosperous. While the town itself doesn't have much in terms of tourist attractions, the surroundings have. The Herero people were the original settlers in this area, and they called the place Otjiwarongo, meaning 'place where fat cattle graze'. 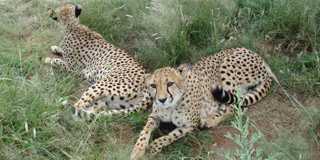 Otjiwarongo is the cheetah capital of the world thanks to the efforts of the Cheetah Conservation Fund. 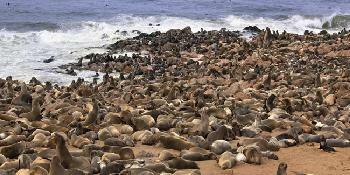 The Skeleton Coast is normally associated with famous shipwrecks, and stories abound of sailors walking for hundreds of kilometres through this barren Namibian landscape in search of food and water. 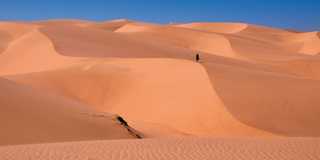 Namibia's most famous destination, in the heart of the Namib desert, with towering dunes and surrounding a huge dried-up pan. 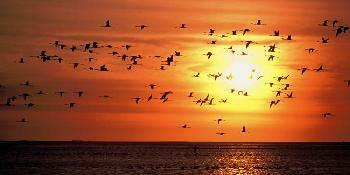 An ideal time to visit is at sunrise or sunset when the changing mood and colours are fascinating to see. 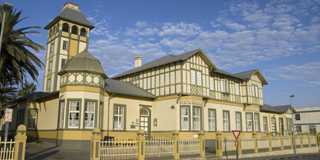 With its proud German architecture and palm-hemmed promenade, Swakopmund sits snugly between the dunes of the Namib Desert and the surf of the Atlantic Coast. In the heart of the country, surrounded by the Khomas Highland, Auas and Eros Mountains, Windhoek is Namibia’s pretty, unassuming capital. 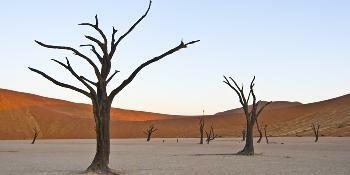 This flying tour enables you to visit all of Namibia's most famous and scenic destinations. 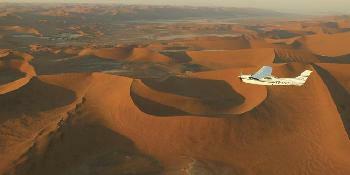 A flexible flying safari offering amazing views of Namibia and visiting some of the most famous areas of the country. 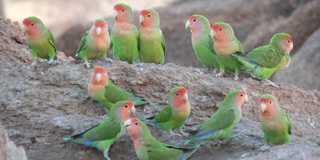 A private guided tour visiting the highlights of the Southern part of Namibia with a personal driver/guide throughout. The tour is operated in an eight seater vehicle. Admire the deep gorges of the Fish River Canyon, climb the world's highest dunes at Sossusvlei and discover the life of the desert on this flying safari. Explore the Namib Desert, the apricot coloured dunes of Sossusvlei, the romantic coastal town of Swakopmund nestled between the Ocean and the Desert, the rough terrain of Damaraland and the wildlife in Etosha National Park. 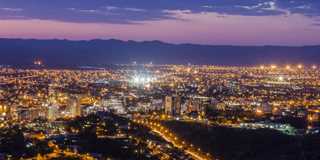 This tour visits nearly all of Namibia's 'hot-spots', starting in Windhoek, the very low-key and pretty capital. Imagine driving through the 5000 square km of National Park, sanctuary for black and white rhinos, large herds of elephants, lions, loads of bird life and being able to stop wherever and whenever you want, you are now in Etosha. 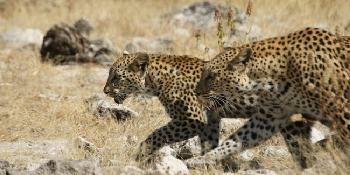 This tour visits all of Namibia's 'hot-spots' including Etosha National Park, the country's greatest wildlife reserve. 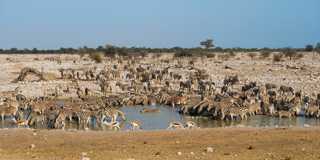 At various waterholes zebra, wildebeest and gemsbok drink to the trumpeting of elephants and roaring of lions.